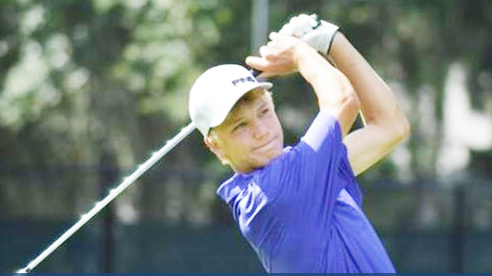 Medalist Jordan Warnock won his first two matches at the CGA SC Junior Match Play championship. Photo from the CGA. 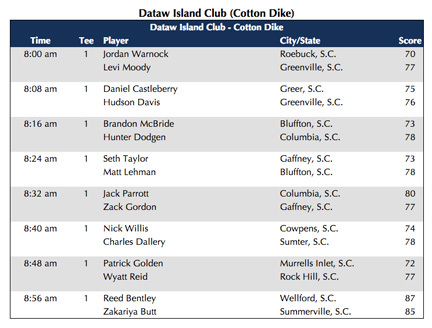 The top seeds in the boys division advanced to the round of 16 at the CGA SC Junior Match Play championship being played at the Dataw Island Club. Medalist Jordan Warnock from Roebuck won two matches. He defeated Wilhelm Elliott of Columbia 9&7 in the round of 64. He then topped James May of Ninety Six 3&2 in the round of 32. Warnock now faces Levi Moody of Travelers Rest in a round of 16 match. Moody had a convincing win in the first match and won his way into the round of 16 with a 2&1 victory over Walker Campbell of Hilton Head. Morgan Cox of Pickens won last year’s girls tournament and had a bye into the round of 16. Cox will match up against SCWGA Junior champion Ashley Czarnecki of Greenville. 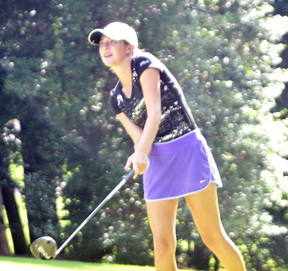 Czarnecki topped Brooke Hutto of Aiken 5&3. Medalist Anna Eddy of Hilton Head defeated Sarah Smith of York 5&3 to advance to the round of 8.